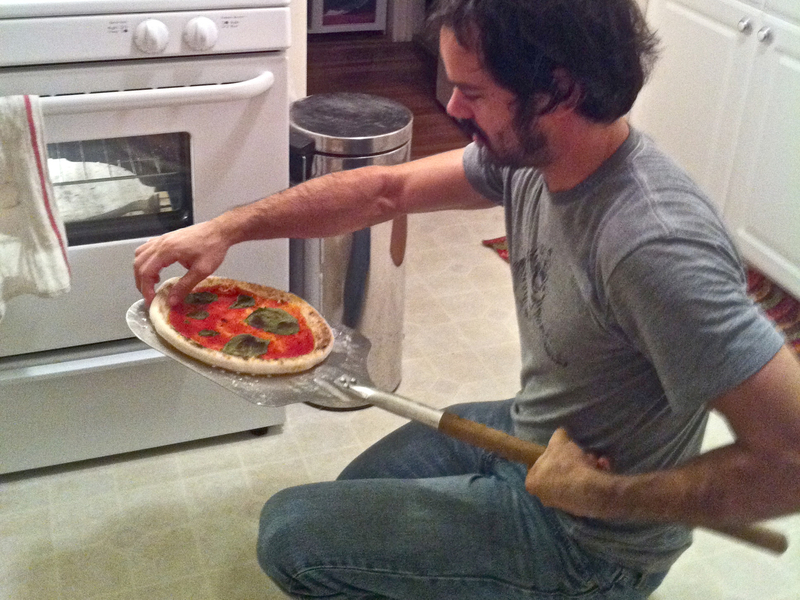 One of the challenges I’m discovering as I push deeper and deeper for pizzamaking excellence is that the tools, techniques and time involved become more intensive and demanding with each step forward. Childhood pizzas were spaghetti sauce and cheese on french bread, melted in the toaster oven. 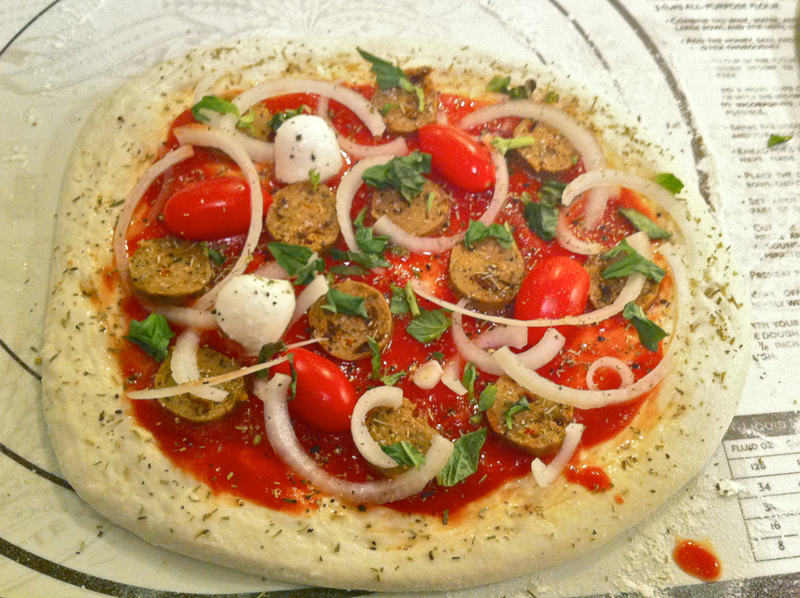 Boboli-style pre-cooked doughs followed, topped with Contadina pizza sauce and grated mozzarella. A pizza stone got added to the process, helping crisp the crust in place of the dampness-inducing cookie sheet – at the expense of an increasing pre-warming time. Fresh dough became a thing of intrigue, supplied by bakeries on the east coast and Trader Joe’s elsewhere. “Pizza peel” becomes part of my vocabulary. Then a second one, this time aluminum. Refrigerated dough led to freshly prepared, courtesy a donated bread machine on the “dough” setting mixing up the flour, water, salt and Fleischmans. More control (and burnt out gears) mandate a large new Kitchen Aid. Wanting more flavor led to regularly feeding wild yeast and learning baker’s percentages. A Neapolitan pizza discovery still looming in my mind, wood-fired ovens became part of the experiment, requiring specific types of fuel and lengthy heating times, not to mention an expanding tool kit. It’s a fun journey, one that continues to challenge and evade, but supplying continuously satisfying results as I keep pushing down the trail. With almost all parts of my pizza process now requiring a considerable amount of hand-crafted attention, I’m actually making pizza less frequently than in earlier days. So the introduction of a time-saving technique that gives results that are almost on par with what I get from a full pizza-making event is a wonderful find that can let me enjoy and share pizza on a smaller, faster scale, when those moments arise. 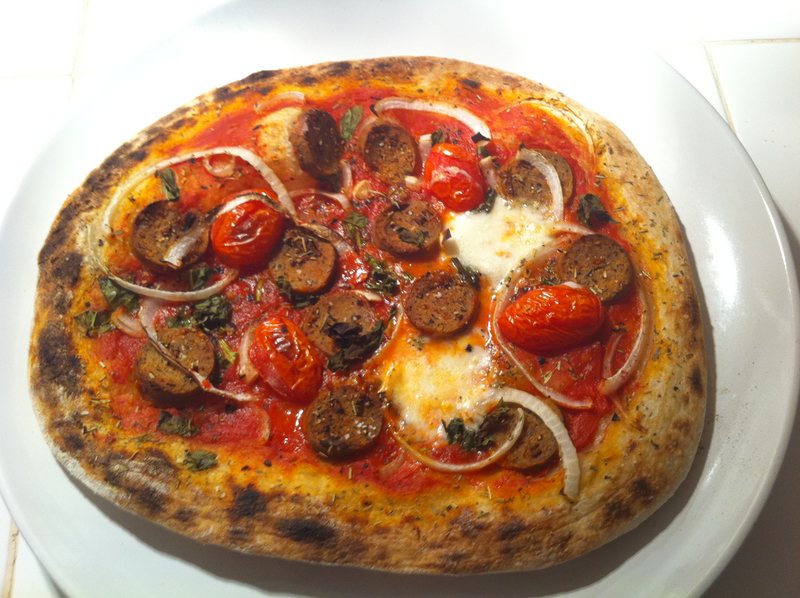 Last week I was able to try a new technique that emulates a neapolitan pizza using a standard home oven. 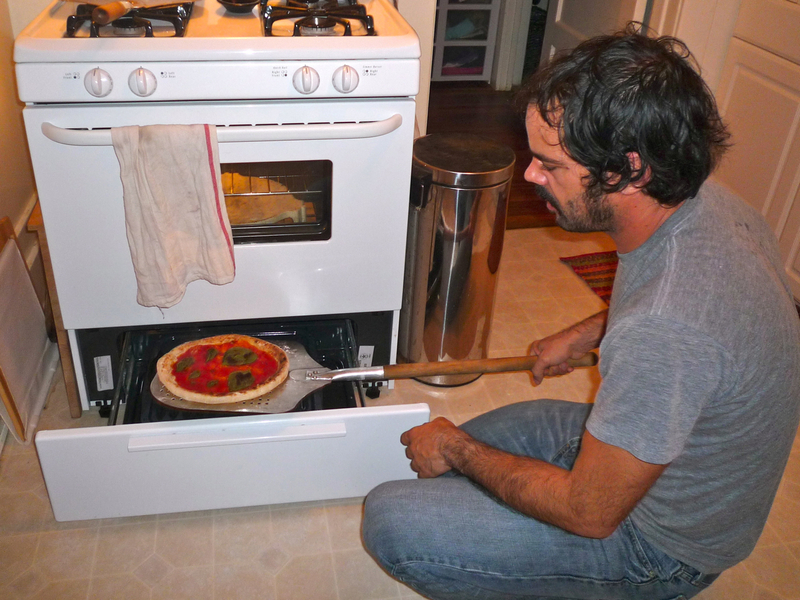 Home ovens are plagued by an upper limit of usually 500 or 550º F – a good 200-300º cooler than what standard Neapolitan pies are baked at. J. Kenji Lopez-Alt at the pizza blog Slice took this limitation as a challenge and began a series of experiments to find a way to make something great using the limited tools a normal kitchen has. One of the key strengths of a wood-fired oven is that the ambient air temperature reaches and stays at an ungodly temperature, where your normal kitchen unit strains at its maximum, and instantly loses all heat as soon as that giant door is opened. 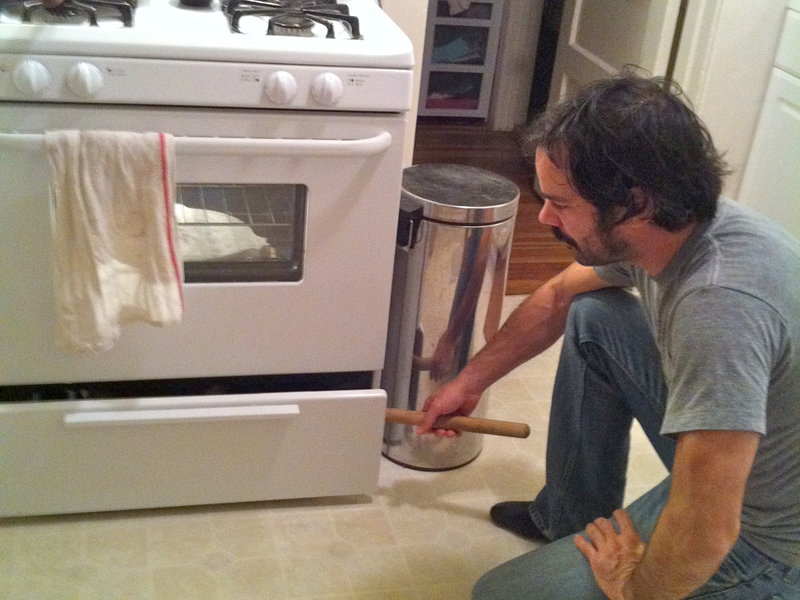 J. Kenji realized that for cooking the pizza dough properly, the air temperature was more important than having a hot stone. A standard oven cooks the pizza from the bottom up, toasting the dough as the heat conducts its way towards the toppings. 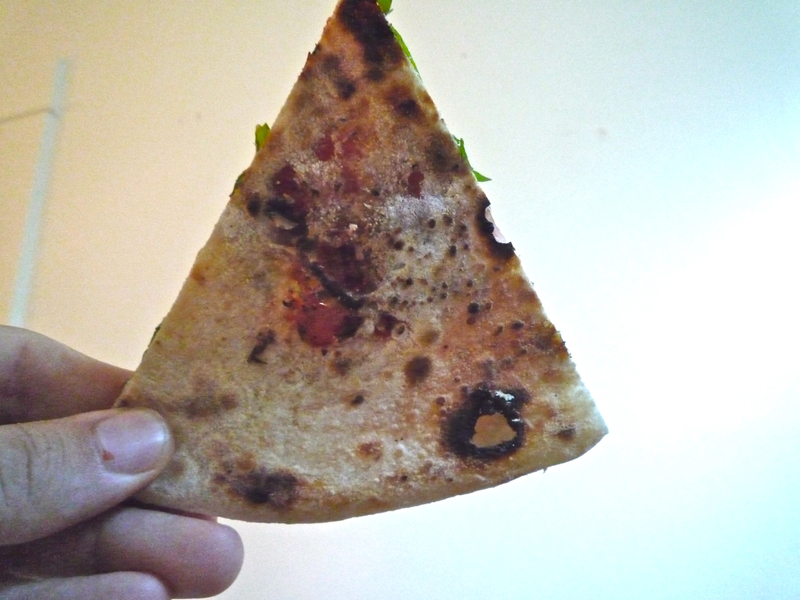 This leads to stiffer, flatter pizzas that don’t have the lift and light chewyness that aficionados are striving for. 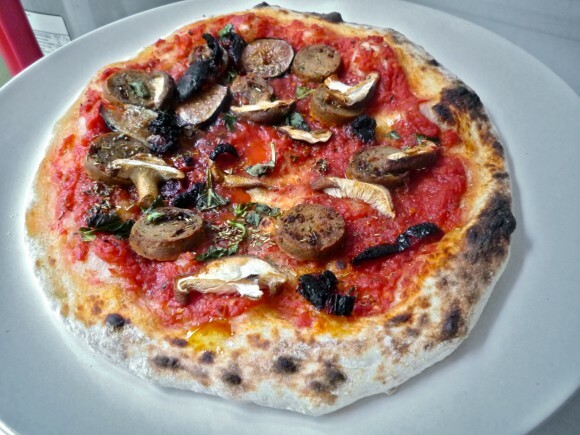 When the majority of the heat contacts the top of the pizza first (as happens in domed brick ovens), the dough on the top of the pizza begins to steam and plump up, rising considerably before forming a toasty shell around the soft interior. The bricks below, around 750 degrees, help wick away the moisture and crisp the bottom quickly, further helping the dough achieve a fluffy warm state. Toppings at this temperature similarly get a desirable slight charring on the outside, while the interiors cook moistly. To avoid having the bottom of the pizza ruin the top, J. Kenji utilized the part of the oven that puts out the greatest amount of heat, and at close proximity: the broiler. 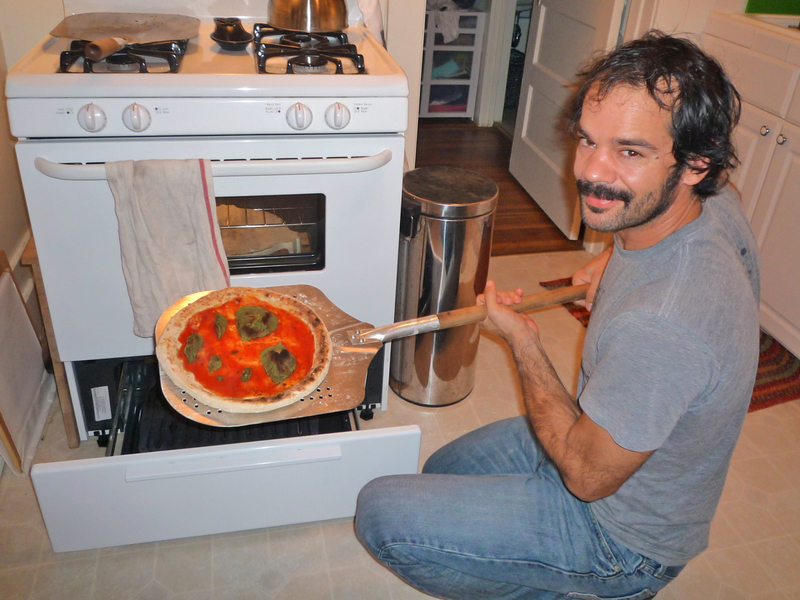 Using an iron skillet, the results were extremely favorable – even moreseo when the skillet was moved to the stove and the bottom of the pizza cooked on maximum temperature. 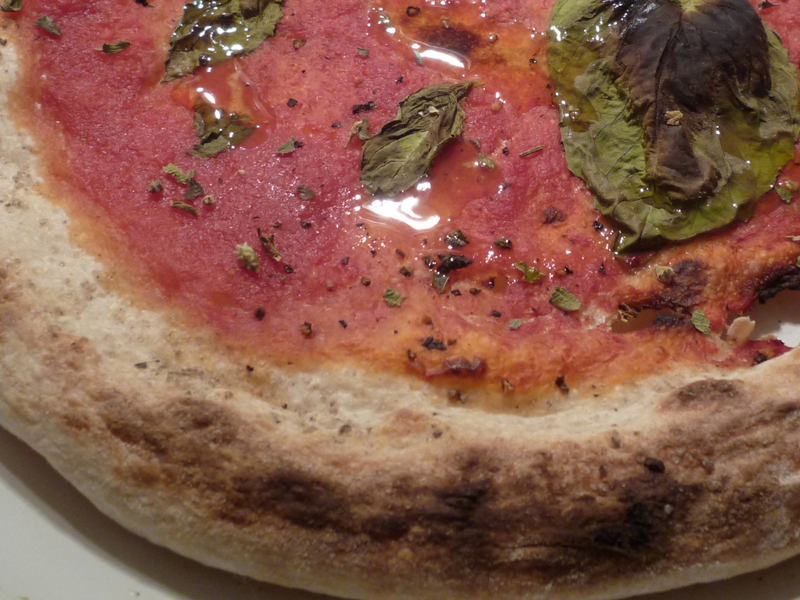 The pizza was actually nearly Neapolitan. Inspired by the Slice article, I’ve begun experimenting with this same technique, but in place of using an iron skillet, I place my entire pizza peel into the broiler. In the short time that is needed, the wood handle doesn’t warm up as fast as the dough does, although I’ve had to wrestle a bit to make sure the pizza dough doesn’t cook itself onto the blade. Step two of my modified process is to transfer the pizza to a pizza stone in my oven for a few minutes, which has been pre-heated on the oven floor directly above the broiler. This takes a bit more time than using the stove top (again, I still lack a skillet), but I find the ambient oven temperature finishes cooking the top nicely as well. The results? UNREAL. 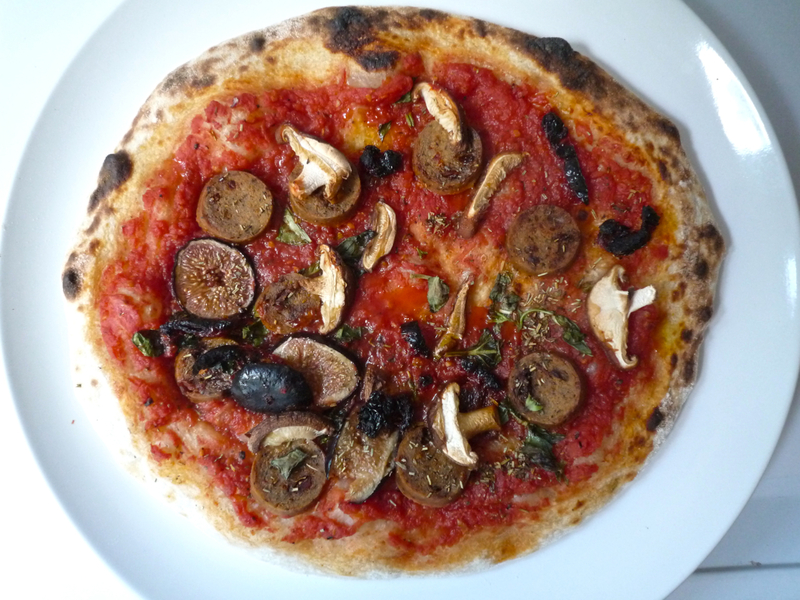 Fast, easy pizza that tastes unbelievable, especially using a nicely made sour dough that has been aged a few days and shaped carefully. A few days after my Halloween Pizza Bash, I found some remaining dough in the back of my fridge. Normally, five days means the end of a dough’s usefulness, as the yeast has eaten through all the proteins of the flour and rendered it too weak to hold itself together. But something about my last batch looked lively. The container appeared to be holding something that still had air, the top of the dough looked dry, and underneath wasn’t too pocketed with cobweb-looking strands. I shaped it without any issues, and cooked it with the broiler technique. 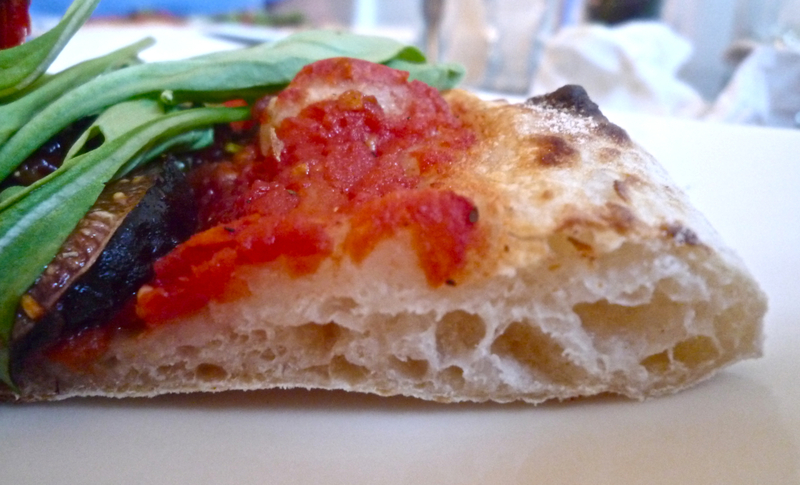 The dough was amazing – even producing bubbling that charred on the edges to start to get that “leopard spot” look that pizza maniacs are always chasing after. 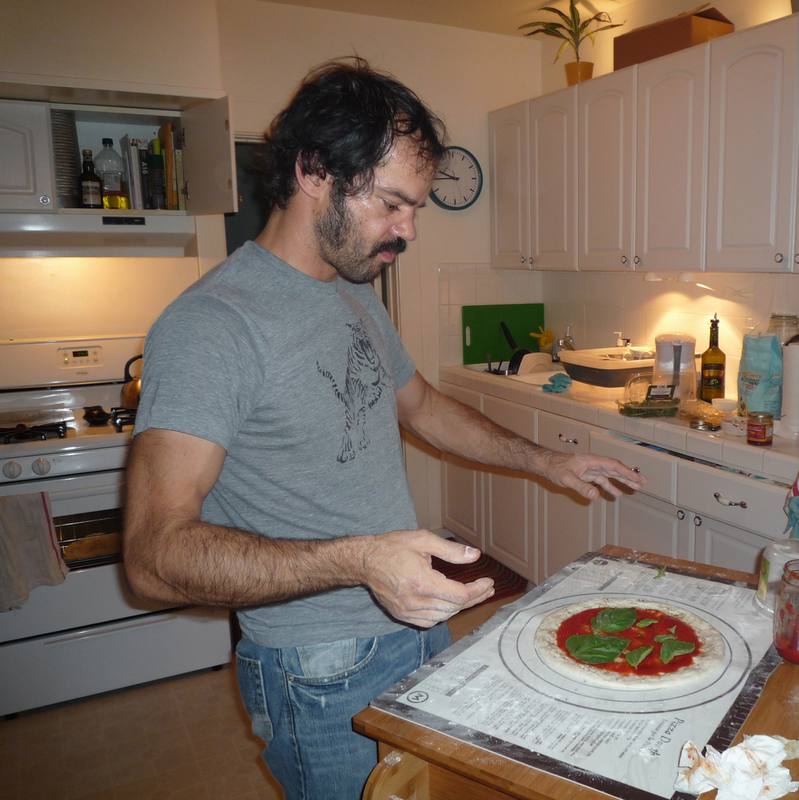 Trying to make a great pizza involves a lot of care and a fair amount of luck, as many invisible and uncontrollable variables can help or hinder the results greatly. On this batch, I got lucky. I even made a video about it. (To answer the people who asked, this is the pizza mat I’m using. Makes cleanup a piece of cake). I really appreciate the evidence-based approach to cooking – I’ve been working for a few years on Sourdough loaf & it takes a LOT of experimentation.